…you hear a clatter in the hallway, ‘Ah, the postman’ you think to yourself. Sure enough, your post is lying on the carpet and in amongst your usual mail lays a little white envelope. Intrigued, you pick it up and open the seal… it’s Sarah and Pete’s wedding invitation! Squee! You and your guests could experience the same joy with the beautifully modest Pearls Day wedding invitation from Bride & Groom Direct. The first thing you’ll see is your names printed in a stunning gold ink, perfectly placed in the middle of luxurious parchment-style card. A scalloped edge makes the most of the 215 x 105mm wallet style invitation, drawing your eyes to a collection of embossed floral bouquets beautifully arranged along the opening. 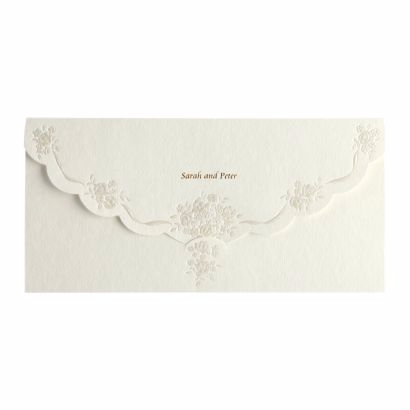 A subtle slot enables the invitation to be tucked up neatly and easily, ready for posting. Inside, your chosen wording will be professionally printed to ensure a perfect finish and the co-ordinating parchment envelopes will create a seamless feel throughout. Traditional in appearance, quirky in layout and sophisticated in style, this design is super versatile and will compliment almost any wedding theme. Similarly, the simplicity of the Pearls Day invitation means it has a timeless quality that will have you swooning over it just as much in 10 years’ time, as you did when you sent them out to your guests! Tags: Elegant, Ivory, Parchment, Pretty, Simple, Sophisticated.